The ancient craft of papermaking was practiced long before the arrival of the Spaniards. Amate paper is made by crisscrossing strips of wet bark and then beating them with a stone hammer and laying them out to dry. 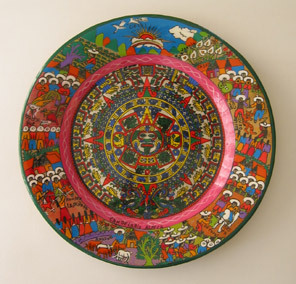 Amate is still used by the Otomí Indians in the state of Puebla. 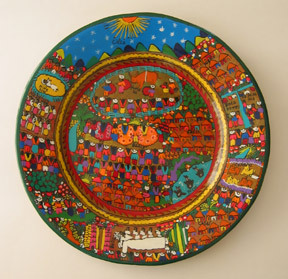 The Amate paper is also sold to artisans in the state of Guerrero who create colorful and beautiful bark paintings. 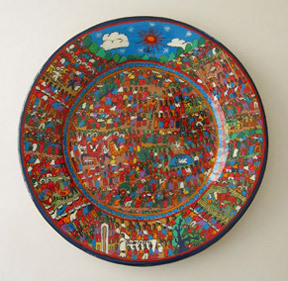 An entire art form has developed creating pottery plates and many other figures with the style of painting usually seen on Amate bark paintings. This kind of painting is true folk art, depicting pastoral and urban scenes, festivals and celebrations as well as ordinary daily life.